1. Cream together the butter & sugar until pale & fluffy. Beat in the egg and the treacle. 2. Sift flour into the bowl, add spices and stir until thoroughly combined. You need the mixture to be a stiff paste consistency, so if it seems a bit dry, add some milk – if it seems too sticky, add a bit more flour. 3. Knead lightly on a floured surface, then wrap in cling film and chill for at least 30 minutes. 5. On a floured surface, roll out the dough to approx. 5-8mm thick (depending on the size of your table or worktop, you may need to do have the quantity at a time) and cut out pretty shaped biscuits. I use a small heart shaped cutter, you don’t want anything more than a couple of mouthfuls as they are quite strongly flavoured. Keep re-combining and rolling out the off-cuts until you can’t cut any more. 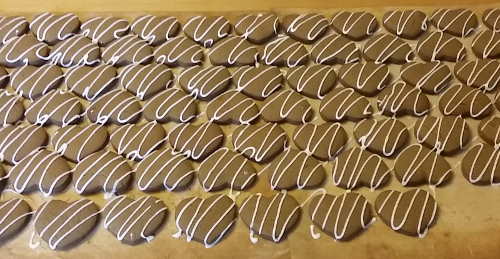 Make sure they’re spaced out on the baking trays with a small gap between each biscuit, and bake for 10-12 minutes. Let them cool on the baking trays for 5 minutes then finish cooling on a wire rack. Like most biscuits, they will continue to bake as they cool so don’t leave them in the oven too long. 6. Combine icing sugar and freshly squeezed orange juice (or cold water with or without flavouring) to make glace icing around a soft dropping consistency, and use this to cover the biscuits. I normally pipe the icing across them as shown below but, as I realised having not done much piping for a number of years, this is not always as easy as it appears! 7. Enjoy eating and, if you end up making the kind of quantities I normally do, share with *all* your friends!